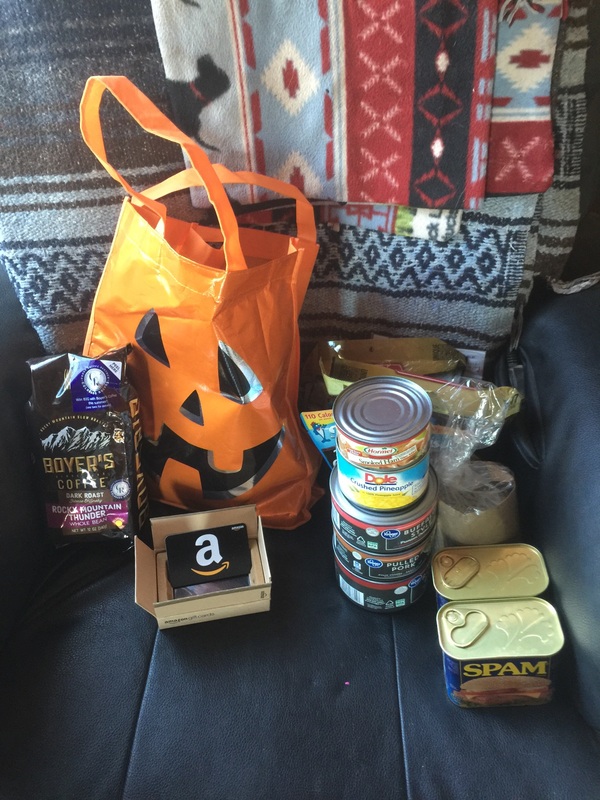 Care Packages – Look at all this food! A couple of Generous Readers, emphatically including Big Brother, seem to fear I’m going to starve! I’ve got snackies to last me the month – or until 3PM today if I left it out, so I hauled by far the majority up to the loft where it won’t be in sight and in mind. …though I left the pizza makings out, because pizza. And canned meat! I love this stuff. And between the two gifts there are eight cans of Spam, which along with eggs is the protein staple of my diet. Fried Spam, people. It is the answer. I don’t even care what you pick to be the question. 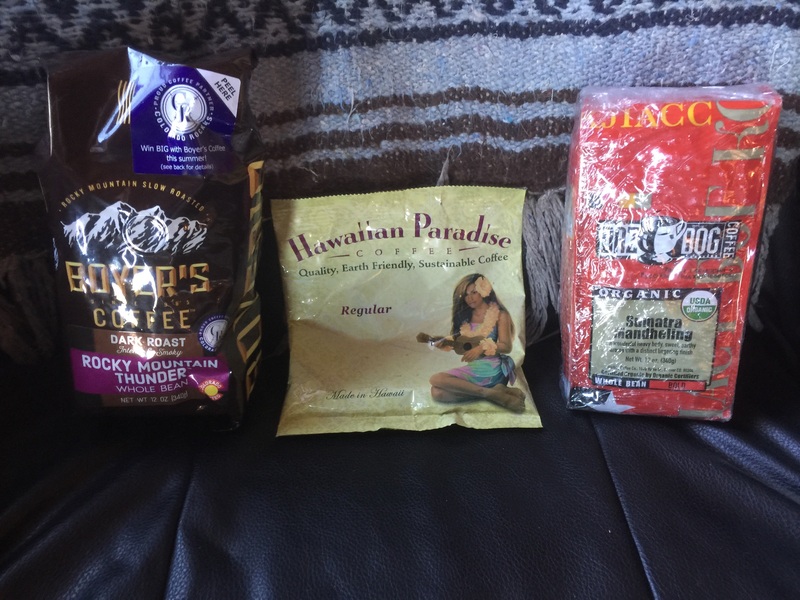 In answer to last month’s lament about my little first world problem, two people sent me 12-ounce packages of their favorite coffee for my sampling pleasure. Plus that little envelope of Hawaiian Paradise, about which I know nothing but I left it down so I can try it right away. I’m less than two weeks into the last can of Trader Joe’s House Blend, so it’ll be most of a month before I can crack open one of the new ones. 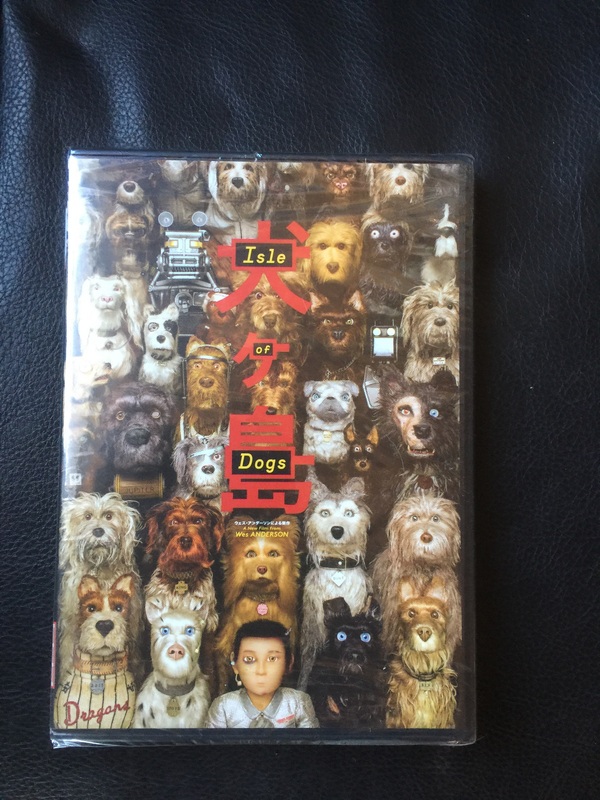 Claire recommended this movie some time ago, I’ve never seen it, and I impulsively put it on my wishlist. Thank you! In regard to the dog treats in that first photo, Laddie has biscuits to last him a while (I had just stocked up with a big box when LB got really sick and died in June, and then J&B brought another big box and I haven’t opened either one, and now here’s another medium box) but he has recently discovered these flavored rawhide sticks to be to his liking. Laddie has rather exacting standards*: He doesn’t know what to do with a rawhide bone and isn’t interested in learning, he burned out on pig ears right away, but he does seem to like these rawhide sticks. Speaking of Amazon, that gift card above is for $25 which will get me a good ways toward a personal purchase I suddenly have to make. It can’t be said too often, you guys rock. Sometimes you keep me going. Thank you! *He came with preconceived notions about treats, which it has mostly been my responsibility to figure out. He thinks he needs a biscuit after every expedition outdoors, AND he wants a cellophane-wrapped treat of some sort before he will settle down in his bed at night. He’s worse than a toddler. 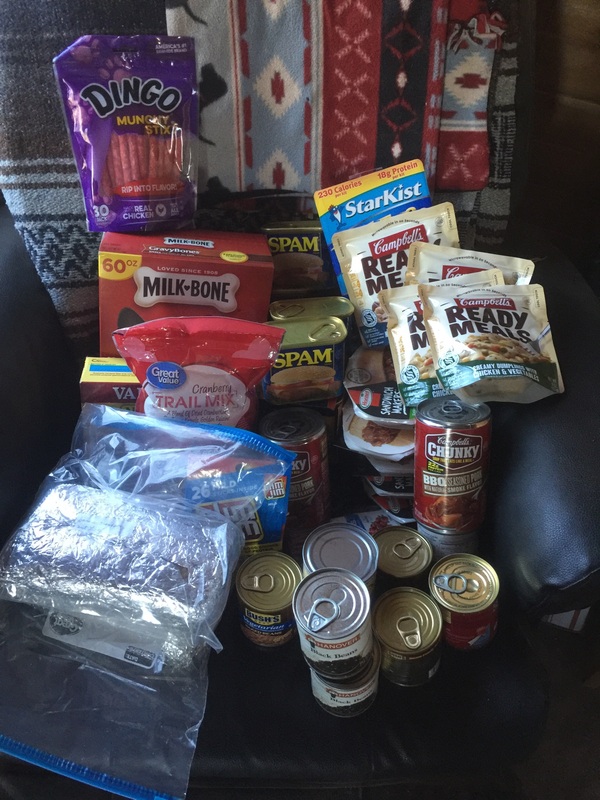 12 Responses to Care Packages – Look at all this food! Out of curiosity, where is the information on how to mail you care packages? i’ve looked around but see no address info on the sidebar or other pages. CZ, if you go to the Send Joel Stuff page, you’ll find an email address on the second paragraph. If you send me an email I’ll reply with my maildrop address. Speaking of “Spam”, I have just discovered that a can, shredded into a pot of beans (using a cheese shredder) and adding an onion and other stuff, makes a pretty fast and good “pork and beans”. Goober, I’m afraid you are wrong. The best sandwich on earth is Cheddar cheese, mayo, peanut butter and sweet pickles. I know some will say it sounds gross but just try it. You can leave the sweet pickles off if you don’t like them. Another superb sandwich . . .
Peanut butter, mayo and honey. Mayo on one slice of bread, peanut butter on the other, and honey on the peanut butter. Assemble, enjoy. Not very much honey. Just a little spread over the PB. Turns any PB into JIF. Nothing better than fried Spam, eggs, hot biscuits right out of the oven, coffee and reading the latest post on Joel’s blog. It just makes the day.